To promote their growth, cancer cells misappropriate angiogenic signals, including endothelial cell–expressed Serpine1, which encodes the plasminogen activator inhibitor PAI-1. The inhibition of plasmin leads to persistent perivascular fibrin deposition and growth factor sequestration in the tumor microenvironment. In this issue of the JCI, McCann et al. 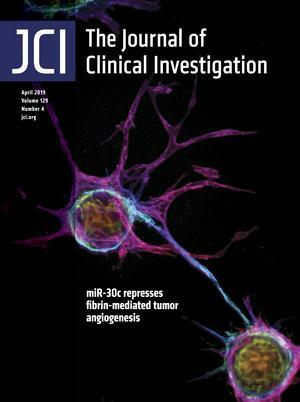 reveal an essential role for miR-30c in controlling fibrin-mediated tumor angiogenesis. They discovered that TGF-β–driven reduction in miR-30c enhances PAI-1 expression and perivascular fibrin deposition in endothelial cells that support angiogenesis. They further demonstrate that miR-30c mimics decrease whereas miR-30c antagomiRs increase fibrin-mediated endothelial sprouting and tumor growth. The cover image shows endothelial cell sprouting in a fibrin matrix. Image credit: James McCann. Citation Information: J Clin Invest. 2019;129(4):1403-1404. https://doi.org/10.1172/JCI128550. Citation Information: J Clin Invest. 2019;129(4):1405-1406. https://doi.org/10.1172/JCI128050. Citation Information: J Clin Invest. 2019;129(4):1407-1418. https://doi.org/10.1172/JCI122287. Citation Information: J Clin Invest. 2019;129(4):1419-1430. https://doi.org/10.1172/JCI124604. Citation Information: J Clin Invest. 2019;129(4):1452-1462. https://doi.org/10.1172/JCI124607. Citation Information: J Clin Invest. 2019;129(4):1463-1474. https://doi.org/10.1172/JCI124608. Citation Information: J Clin Invest. 2019;129(4):1475-1482. https://doi.org/10.1172/JCI124609. Citation Information: J Clin Invest. 2019;129(4):1483-1492. https://doi.org/10.1172/JCI124610. Citation Information: J Clin Invest. 2019;129(4):1493-1503. https://doi.org/10.1172/JCI124611. Citation Information: J Clin Invest. 2019;129(4):1504-1515. https://doi.org/10.1172/JCI124612. Citation Information: J Clin Invest. 2019;129(4):1516-1518. https://doi.org/10.1172/JCI128898. The American Society for Clinical Investigation (ASCI), a nonprofit honorary society, was established to support physician-scientists by serving as a benchmark of excellence in medical research, a forum to celebrate advances in medicine, and a vehicle to communicate advances that bridge basic and translational research and their implementation across the growing myriad of medical specialties. A core intention of the Society is to engage the medical research community broadly through transparent communications of our activities and initiatives with the institutions that comprise the base for our membership. Recognizing the importance in identifying and actuating a strategy to support the Society’s broad mission, the current leadership has undertaken a strategic plan that initiates with the goal of revamping its Institutional Representatives program. While the Society has grown with the historical privilege of close connections to institutions through an informal web created largely by the elected membership, we aim to improve institutional engagement towards overall goals of embracing and enhancing diversity of our community and implementing future collaborative programs to support physician-scientists. We briefly review ASCI’s history, mission, and structure, and present the blueprint of the new Institutional Representatives program. Citation Information: J Clin Invest. 2019;129(4):1519-1521. https://doi.org/10.1172/JCI127582. The identification of JAK2 mutations as disease-initiating in myeloproliferative neoplasms (MPNs) has led to new and effective therapies for these diseases. In a study published in this issue of the JCI, Stivala et al. explored the key observation that JAK inhibition successfully suppresses MAPK activation in MPN cell lines and primary MPN cells in vitro, and the finding that it failed to completely and effectively suppress MAPK activation in vivo in two mouse models. The authors went on to show that dual inhibition of JAK and the MAP kinase pathway provided enhanced therapeutic efficacy in the in vivo models of MPN. Citation Information: J Clin Invest. 2019;129(4):1522-1523. https://doi.org/10.1172/JCI127581. Genetically engineered T cells have shown promising activity in the treatment of cancer. However, these cells are also potentially susceptible to immune-suppressive pathways in the tumor microenvironment that may limit their efficacy. In this issue of the JCI, Yamamoto et al. describe a new cellular engineering approach to prevent Fas-mediated inhibition of T cell function, which may be exploited to improve cellular therapy for cancer. Citation Information: J Clin Invest. 2019;129(4):1524-1526. https://doi.org/10.1172/JCI127583. Chronic unresolved inflammation contributes to the development of nonalcoholic steatohepatitis (NASH), a disorder characterized by lipotoxicity, fibrosis, and progressive liver dysfunction. In this issue of the JCI, Han et al. report that maresin 1 (MaR1), a proresolving lipid mediator, mitigates NASH by reprograming macrophages to an antiinflammatory phenotype. Mechanistically, they identified retinoic acid–related orphan receptor α (RORα) as both a target and autocrine regulator of MaR1 production. Because NASH is associated with many widely occurring metabolic diseases, including obesity and type 2 diabetes, identification of this endogenous protective pathway could have broad therapeutic implications. The vasculature in sepsis: delivering poison or remedy to the brain? Citation Information: J Clin Invest. 2019;129(4):1527-1529. https://doi.org/10.1172/JCI127679. Survivors of sepsis and other forms of critical illness frequently experience significant and disabling cognitive and affective disorders. Inflammation, ischemia, and glial cell dysfunction contribute to this persistent brain injury. In this issue of the JCI, Hippensteel et al. show that endothelial injury in animal models of sepsis or endotoxemia leads to shedding of heparan fragments from the endothelial glycocalyx. These fragments directly sequester brain-derived neurotrophic factor and impair hippocampal long-term potentiation, an electrophysiologic correlate of memory. The authors further explore the specific characteristics of heparan fragments that bind neurotrophins and the presence of these fragments in the circulation of patients who survive sepsis. This study highlights an important mechanism by which vascular injury can impair brain function. Citation Information: J Clin Invest. 2019;129(4):1530-1532. https://doi.org/10.1172/JCI127682. In this issue of the JCI, Casas et al. define a previously unknown role of the NADPH oxidase catalytic subunit NOX5 in cerebral infarction. Using a mouse expressing human NOX5 in the endothelium, the investigators show that NOX5 is activated and plays a deleterious role in promoting edema, infarction, and ultimately, worsened neurological function following cerebral ischemia. They provide evidence that this is due to the breakdown of the blood-brain barrier (BBB) and that a unique pharmacological inhibitor of NOX5, ML090, if given early, around the time of reoxygenation, can maintain BBB integrity. Future studies of NOX5 inhibition in humans, particularly in the setting of thrombolysis, are warranted. Citation Information: J Clin Invest. 2019;129(4):1533-1535. https://doi.org/10.1172/JCI127820. Motoneurons are particularly sensitive to mutations in mitofusin-2 (MFN2) that cause the neurological disorder Charcot-Marie-Tooth disease type 2A (CMT2A). MFN2 is a mitochondrial outer membrane protein that, together with its homologue MFN1, fuses mitochondria in most tissues. In this issue of the JCI, Zhou and colleagues show that increasing MFN1 expression in neurons can curtail neurological defects in a CMT2A mouse model. These results show that the ratio of MFN1 to MFN2 can explain the tissue specificity of CMT2A and indicate that augmentation of MFN1 in the nervous system has potential as a possible therapeutic strategy for CMT2A. Citation Information: J Clin Invest. 2019;129(4):1536-1550. https://doi.org/10.1172/JCI120412. Poststroke cognitive impairment is considered one of the main complications during the chronic phase of ischemic stroke. In the adult brain, the hippocampus regulates both encoding and retrieval of new information through adult neurogenesis. Nevertheless, the lack of predictive models and studies based on the forgetting processes hinders the understanding of memory alterations after stroke. Our aim was to explore whether poststroke neurogenesis participates in the development of long-term memory impairment. Here, we show a hippocampal neurogenesis burst that persisted 1 month after stroke and that correlated with an impaired contextual and spatial memory performance. Furthermore, we demonstrate that the enhancement of hippocampal neurogenesis after stroke by physical activity or memantine treatment weakened existing memories. More importantly, stroke-induced newborn neurons promoted an aberrant hippocampal circuitry remodeling with differential features at ipsi- and contralesional levels. Strikingly, inhibition of stroke-induced hippocampal neurogenesis by temozolomide treatment or using a genetic approach (Nestin-CreERT2/NSE-DTA mice) impeded the forgetting of old memories. These results suggest that hippocampal neurogenesis modulation could be considered as a potential approach for treatment of poststroke cognitive impairment. Citation Information: J Clin Invest. 2019;129(4):1551-1565. https://doi.org/10.1172/JCI121491. Across clinical trials, T cell expansion and persistence following adoptive cell transfer (ACT) have correlated with superior patient outcomes. Herein, we undertook a pan-cancer analysis to identify actionable ligand-receptor pairs capable of compromising T cell durability following ACT. We discovered that FASLG, the gene encoding the apoptosis-inducing ligand FasL, is overexpressed within the majority of human tumor microenvironments (TMEs). Further, we uncovered that Fas, the receptor for FasL, is highly expressed on patient-derived T cells used for clinical ACT. We hypothesized that a cognate Fas-FasL interaction within the TME might limit both T cell persistence and antitumor efficacy. We discovered that genetic engineering of Fas variants impaired in the ability to bind FADD functioned as dominant negative receptors (DNRs), preventing FasL-induced apoptosis in Fas-competent T cells. T cells coengineered with a Fas DNR and either a T cell receptor or chimeric antigen receptor exhibited enhanced persistence following ACT, resulting in superior antitumor efficacy against established solid and hematologic cancers. Despite increased longevity, Fas DNR–engineered T cells did not undergo aberrant expansion or mediate autoimmunity. Thus, T cell–intrinsic disruption of Fas signaling through genetic engineering represents a potentially universal strategy to enhance ACT efficacy across a broad range of human malignancies. Citation Information: J Clin Invest. 2019;129(4):1566-1580. https://doi.org/10.1172/JCI123191. Citation Information: J Clin Invest. 2019;129(4):1581-1595. https://doi.org/10.1172/JCI123931. The cytoplasmic aggregation of TAR DNA-binding protein-43 (TDP-43) is a hallmark of degenerating neurons in amyotrophic lateral sclerosis (ALS) and subsets of frontotemporal dementia (FTD). In order to reduce TDP-43 pathology, we generated single-chain (scFv) antibodies against the RNA recognition motif 1 (RRM1) of TDP-43, which is involved in abnormal protein self-aggregation and interaction with p65 NF-κB. Virus-mediated delivery into the nervous system of a scFv antibody, named VH7Vk9, reduced microgliosis in a mouse model of acute neuroinflammation and mitigated cognitive impairment, motor defects, TDP-43 proteinopathy, and neuroinflammation in transgenic mice expressing ALS-linked TDP-43 mutations. These results suggest that antibodies targeting the RRM1 domain of TDP-43 might provide new therapeutic avenues for the treatment of ALS and FTD. Citation Information: J Clin Invest. 2019;129(4):1596-1611. https://doi.org/10.1172/JCI98785. Constitutive JAK2 signaling is central to myeloproliferative neoplasm (MPN) pathogenesis and results in activation of STAT, PI3K/AKT, and MEK/ERK signaling. However, the therapeutic efficacy of current JAK2 inhibitors is limited. We investigated the role of MEK/ERK signaling in MPN cell survival in the setting of JAK inhibition. Type I and II JAK2 inhibition suppressed MEK/ERK activation in MPN cell lines in vitro, but not in Jak2V617F and MPLW515L mouse models in vivo. JAK2 inhibition ex vivo inhibited MEK/ERK signaling, suggesting that cell-extrinsic factors maintain ERK activation in vivo. We identified PDGFRα as an activated kinase that remains activated upon JAK2 inhibition in vivo, and PDGF-AA/PDGF-BB production persisted in the setting of JAK inhibition. PDGF-BB maintained ERK activation in the presence of ruxolitinib, consistent with its function as a ligand-induced bypass for ERK activation. Combined JAK/MEK inhibition suppressed MEK/ERK activation in Jak2V617F and MPLW515L mice with increased efficacy and reversal of fibrosis to an extent not seen with JAK inhibitors. This demonstrates that compensatory ERK activation limits the efficacy of JAK2 inhibition and dual JAK/MEK inhibition provides an opportunity for improved therapeutic efficacy in MPNs and in other malignancies driven by aberrant JAK-STAT signaling. Citation Information: J Clin Invest. 2019;129(4):1612-1625. https://doi.org/10.1172/JCI98747. Although clear cell renal cell carcinoma (ccRCC) has been shown to result in widespread aberrant cytosine methylation and loss of 5-hydroxymethylcytosine (5hmC), the prognostic impact and therapeutic targeting of this epigenetic aberrancy has not been fully explored. Analysis of 576 primary ccRCC samples demonstrated that loss of 5hmC was strongly associated with aggressive clinicopathologic features and was an independent adverse prognostic factor. Loss of 5hmC also predicted reduced progression-free survival after resection of nonmetastatic disease. The loss of 5hmC in ccRCC was not due to mutational or transcriptional inactivation of ten eleven translocation (TET) enzymes, but to their functional inactivation by l-2-hydroxyglutarate (L2HG), which was overexpressed due to the deletion and underexpression of L2HG dehydrogenase (L2HGDH). Ascorbic acid (AA) reduced methylation and restored genome-wide 5hmC levels via TET activation. Fluorescence quenching of the recombinant TET-2 protein was unaffected by L2HG in the presence of AA. Pharmacologic AA treatment led to reduced growth of ccRCC in vitro and reduced tumor growth in vivo, with increased intratumoral 5hmC. These data demonstrate that reduced 5hmC is associated with reduced survival in ccRCC and provide a preclinical rationale for exploring the therapeutic potential of high-dose AA in ccRCC. Citation Information: J Clin Invest. 2019;129(4):1626-1640. https://doi.org/10.1172/JCI98288. The discovery of recurrent mutations in subunits of the vacuolar-type H+-translocating ATPase (v-ATPase) in follicular lymphoma (FL) highlights a role for the amino acid– and energy-sensing pathway to mTOR in the pathogenesis of this disease. Here, through the use of complementary experimental approaches involving mammalian cells and Saccharomyces cerevisiae, we have demonstrated that mutations in the human v-ATPase subunit ATP6V1B2 (also known as Vma2 in yeast) activate autophagic flux and maintain mTOR/TOR in an active state. Engineered lymphoma cell lines and primary FL B cells carrying mutated ATP6V1B2 demonstrated a remarkable ability to survive low leucine concentrations. The treatment of primary FL B cells with inhibitors of autophagy uncovered an addiction for survival for FL B cells harboring ATP6V1B2 mutations. These data support the idea of mutational activation of autophagic flux by recurrent hotspot mutations in ATP6V1B2 as an adaptive mechanism in FL pathogenesis and as a possible new therapeutically targetable pathway. Citation Information: J Clin Invest. 2019;129(4):1641-1653. https://doi.org/10.1172/JCI123049. Hyperactivated AKT/mTOR signaling is a hallmark of pancreatic neuroendocrine tumors (PNETs). Drugs targeting this pathway are used clinically, but tumor resistance invariably develops. A better understanding of factors regulating AKT/mTOR signaling and PNET pathogenesis is needed to improve current therapies. We discovered that RABL6A, a new oncogenic driver of PNET proliferation, is required for AKT activity. Silencing RABL6A caused PNET cell-cycle arrest that coincided with selective loss of AKT-S473 (not T308) phosphorylation and AKT/mTOR inactivation. Restoration of AKT phosphorylation rescued the G1 phase block triggered by RABL6A silencing. Mechanistically, loss of AKT-S473 phosphorylation in RABL6A-depleted cells was the result of increased protein phosphatase 2A (PP2A) activity. Inhibition of PP2A restored phosphorylation of AKT-S473 in RABL6A-depleted cells, whereas PP2A reactivation using a specific small-molecule activator of PP2A (SMAP) abolished that phosphorylation. Moreover, SMAP treatment effectively killed PNET cells in a RABL6A-dependent manner and suppressed PNET growth in vivo. The present work identifies RABL6A as a new inhibitor of the PP2A tumor suppressor and an essential activator of AKT in PNET cells. Our findings offer what we believe is a novel strategy of PP2A reactivation for treatment of PNETs as well as other human cancers driven by RABL6A overexpression and PP2A inactivation. Citation Information: J Clin Invest. 2019;129(4):1654-1670. https://doi.org/10.1172/JCI123106. In tumors, extravascular fibrin forms provisional scaffolds for endothelial cell (EC) growth and motility during angiogenesis. We report that fibrin-mediated angiogenesis was inhibited and tumor growth delayed following postnatal deletion of Tgfbr2 in the endothelium of Cdh5-CreERT2 Tgfbr2fl/fl mice (Tgfbr2iECKO mice). ECs from Tgfbr2iECKO mice failed to upregulate the fibrinolysis inhibitor plasminogen activator inhibitor 1 (Serpine1, also known as PAI-1), due in part to uncoupled TGF-β–mediated suppression of miR-30c. Bypassing TGF-β signaling with vascular tropic nanoparticles that deliver miR-30c antagomiRs promoted PAI-1–dependent tumor growth and increased fibrin abundance, whereas miR-30c mimics inhibited tumor growth and promoted vascular-directed fibrinolysis in vivo. Using single-cell RNA-Seq and a NanoString miRNA array, we also found that subtypes of ECs in tumors showed spectrums of Serpine1 and miR-30c expression levels, suggesting functional diversity in ECs at the level of individual cells; indeed, fresh EC isolates from lung and mammary tumor models had differential abilities to degrade fibrin and launch new vessel sprouts, a finding that was linked to their inverse expression patterns of miR-30c and Serpine1 (i.e., miR-30chi Serpine1lo ECs were poorly angiogenic and miR-30clo Serpine1hi ECs were highly angiogenic). Thus, by balancing Serpine1 expression in ECs downstream of TGF-β, miR-30c functions as a tumor suppressor in the tumor microenvironment through its ability to promote fibrin degradation and inhibit blood vessel formation. Citation Information: J Clin Invest. 2019;129(4):1671-1683. https://doi.org/10.1172/JCI123375. Cytomegalovirus (CMV) has been implicated in glioblastoma (GBM); however, a mechanistic connection in vivo has not been established. The purpose of this study is to characterize the effects of murine CMV (MCMV) on GBM growth in murine models. Syngeneic GBM models were established in mice perinatally infected with MCMV. We found that tumor growth was markedly enhanced in MCMV+ mice, with a significant reduction in overall survival compared with that of controls (P < 0.001). We observed increased angiogenesis and tumor blood flow in MCMV+ mice. MCMV reactivation was observed in intratumoral perivascular pericytes and tumor cells in mouse and human GBM specimens, and pericyte coverage of tumor vasculature was strikingly augmented in MCMV+ mice. We identified PDGF-D as a CMV-induced factor essential for pericyte recruitment, angiogenesis, and tumor growth. The antiviral drug cidofovir improved survival in MCMV+ mice, inhibiting MCMV reactivation, PDGF-D expression, pericyte recruitment, and tumor angiogenesis. These data show that MCMV potentiates GBM growth in vivo by increased pericyte recruitment and angiogenesis due to alterations in the secretome of CMV-infected cells. Our model provides evidence for a role of CMV in GBM growth and supports the application of antiviral approaches for GBM therapy. Citation Information: J Clin Invest. 2019;129(4):1684-1698. https://doi.org/10.1172/JCI124219. Retinoic acid–related orphan receptor α (RORα) is considered a key regulator of polarization in liver macrophages that is closely related to nonalcoholic steatohepatitis (NASH) pathogenesis. However, hepatic microenvironments that support the function of RORα as a polarity regulator were largely unknown. Here, we identified maresin 1 (MaR1), a docosahexaenoic acid (DHA) metabolite with a function of specialized proresolving mediator, as an endogenous ligand of RORα. MaR1 enhanced the expression and transcriptional activity of RORα and thereby increased the M2 polarity of liver macrophages. Administration of MaR1 protected mice from high-fat diet–induced NASH in a RORα-dependent manner. Surprisingly, RORα increased the level of MaR1 through transcriptional induction of 12-lipoxygenase (12-LOX), a key enzyme in MaR1 biosynthesis. Furthermore, we demonstrated that modulation of 12-LOX activity enhanced the protective function of DHA against NASH. Together, these results suggest that the MaR1/RORα/12-LOX autoregulatory circuit could offer potential therapeutic strategies for curing NASH. Citation Information: J Clin Invest. 2019;129(4):1699-1712. https://doi.org/10.1172/JCI124196. Citation Information: J Clin Invest. 2019;129(4):1713-1726. https://doi.org/10.1172/JCI123386. Soluble urokinase receptor (suPAR) is a circulatory molecule that activates αvβ3 integrin on podocytes, causes foot process effacement, and contributes to proteinuric kidney disease. While active integrin can be targeted by antibodies and small molecules, endogenous inhibitors haven’t been discovered yet. Here we report what we believe is a novel renoprotective role for the inducible costimulator ligand (ICOSL) in early kidney disease through its selective binding to podocyte αvβ3 integrin. Contrary to ICOSL’s immune-regulatory role, ICOSL in nonhematopoietic cells limited the activation of αvβ3 integrin. Specifically, ICOSL contains the arginine-glycine-aspartate (RGD) motif, which allowed for a high-affinity and selective binding to αvβ3 and modulation of podocyte adhesion. This binding was largely inhibited either by a synthetic RGD peptide or by a disrupted RGD sequence in ICOSL. ICOSL binding favored the active αvβ3 rather than the inactive form and showed little affinity for other integrins. Consistent with the rapid induction of podocyte ICOSL by inflammatory stimuli, glomerular ICOSL expression was increased in biopsies of early-stage human proteinuric kidney diseases. Icosl deficiency in mice resulted in an increased susceptibility to proteinuria that was rescued by recombinant ICOSL. Our work identified a potentially novel role for ICOSL, which serves as an endogenous αvβ3-selective antagonist to maintain glomerular filtration. Citation Information: J Clin Invest. 2019;129(4):1727-1741. https://doi.org/10.1172/JCI123726. Accumulating evidence demonstrates that CD8+ T cells contribute to protection from severe dengue virus (DENV) disease and vaccine efficacy. Nevertheless, molecular programs associated with DENV-specific CD8+ T cell subsets have not been defined. Here, we studied the transcriptomic profiles of human DENV-specific CD8+ T cells isolated after stimulation with DENV epitopes from donors who had been infected with DENV multiple times and would therefore be expected to have significant levels of adaptive immunity. We found that DENV-specific CD8+ T cells mainly consisted of effector memory subsets, namely CD45RA−CCR7− effector memory (Tem) and CD45RA+CCR7− effector memory re-expressing CD45RA (Temra) cells, which enacted specific gene expression profiles upon stimulation with cognate antigens. DENV-specific CD8+ T cell subsets in general, and Temra cells in particular, were fully activated and polyfunctional, yet associated with relatively narrow transcriptional responses. Furthermore, we found that DENV-specific CD8+ Tem and Temra cells showed some unique T cell receptor features in terms of overlap and variable (V) gene usage. This study provides a transcriptomic definition of DENV-specific activated human CD8+ T cell subsets and defines a benchmark profile that vaccine-specific responses could aim to reproduce. Citation Information: J Clin Invest. 2019;129(4):1742-1755. https://doi.org/10.1172/JCI124077. Pancreatic ductal adenocarcinoma (PDAC) represents an immune quiescent tumor that is resistant to immune checkpoint inhibitors. Previously, our group has shown that a GM-CSF–secreting allogenic pancreatic tumor cell vaccine (GVAX) may prime the tumor microenvironment by inducing intratumoral T cell infiltration. Here, we show that untreated PDACs express minimal indoleamine-2,3-dioxygenase (IDO1); however, GVAX therapy induced IDO1 expression on tumor epithelia as well as vaccine-induced tertiary lymphoid aggregates. IDO1 expression plays a role in regulating the polarization of Th1, Th17, and possibly T regulatory cells in PDAC tumors. IDO1 inhibitor enhanced antitumor efficacy of GVAX in a murine model of PDACs. The combination of vaccine and IDO1 inhibitor enhanced intratumoral T cell infiltration and function, but adding anti–PD-L1 antibody to the combination did not offer further synergy and in fact may have had a negative interaction, decreasing the number of intratumoral effector T cells. Additionally, IDO1 inhibitor in the presence of vaccine therapy did not significantly modulate intratumoral myeloid-derived suppressor cells quantitatively, but diminished their suppressive effect on CD8+ proliferation. Our study supports the combination of IDO1 inhibitor and vaccine therapy; however, it does not support the combination of IDO1 inhibitor and anti–PD-1/PD-L1 antibody for T cell–inflamed tumors such as PDACs treated with vaccine therapy. Citation Information: J Clin Invest. 2019;129(4):1756-1771. https://doi.org/10.1172/JCI124194. Mitofusin-2 (MFN2) is a mitochondrial outer-membrane protein that plays a pivotal role in mitochondrial dynamics in most tissues, yet mutations in MFN2, which cause Charcot-Marie-Tooth disease type 2A (CMT2A), primarily affect the nervous system. We generated a transgenic mouse model of CMT2A that developed severe early onset vision loss and neurological deficits, axonal degeneration without cell body loss, and cytoplasmic and axonal accumulations of fragmented mitochondria. While mitochondrial aggregates were labeled for mitophagy, mutant MFN2 did not inhibit Parkin-mediated degradation, but instead had a dominant negative effect on mitochondrial fusion only when MFN1 was at low levels, as occurs in neurons. Finally, using a transgenic approach, we found that augmenting the level of MFN1 in the nervous system in vivo rescued all phenotypes in mutant MFN2R94Q-expressing mice. These data demonstrate that the MFN1/MFN2 ratio is a key determinant of tissue specificity in CMT2A and indicate that augmentation of MFN1 in the nervous system is a viable therapeutic strategy for the disease. Citation Information: J Clin Invest. 2019;129(4):1772-1778. https://doi.org/10.1172/JCI124283. Ischemic stroke is a predominant cause of disability worldwide, with thrombolytic or mechanical removal of the occlusion being the only therapeutic option. Reperfusion bears the risk of an acute deleterious calcium-dependent breakdown of the blood-brain barrier. Its mechanism, however, is unknown. Here, we identified type 5 NADPH oxidase (NOX5), a calcium-activated, ROS-forming enzyme, as the missing link. Using a humanized knockin (KI) mouse model and in vitro organotypic cultures, we found that reoxygenation or calcium overload increased brain ROS levels in a NOX5-dependent manner. In vivo, postischemic ROS formation, infarct volume, and functional outcomes were worsened in NOX5-KI mice. Of clinical and therapeutic relevance, in a human blood-barrier model, pharmacological NOX inhibition also prevented acute reoxygenation-induced leakage. Our data support further evaluation of poststroke recanalization in the presence of NOX inhibition for limiting stroke-induced damage. Citation Information: J Clin Invest. 2019;129(4):1779-1784. https://doi.org/10.1172/JCI124485. Septic patients frequently develop cognitive impairment that persists beyond hospital discharge. The impact of sepsis on electrophysiological and molecular determinants of learning is underexplored. We observed that mice that survived sepsis or endotoxemia experienced loss of hippocampal long-term potentiation (LTP), a brain-derived neurotrophic factor–mediated (BDNF-mediated) process responsible for spatial memory formation. Memory impairment occurred despite preserved hippocampal BDNF content and could be reversed by stimulation of BDNF signaling, suggesting the presence of a local BDNF inhibitor. Sepsis is associated with degradation of the endothelial glycocalyx, releasing heparan sulfate fragments (of sufficient size and sulfation to bind BDNF) into the circulation. Heparan sulfate fragments penetrated the hippocampal blood-brain barrier during sepsis and inhibited BDNF-mediated LTP. Glycoarray approaches demonstrated that the avidity of heparan sulfate for BDNF increased with sulfation at the 2-O position of iduronic acid and the N position of glucosamine. Circulating heparan sulfate in endotoxemic mice and septic humans was enriched in 2-O– and N-sulfated disaccharides; furthermore, the presence of these sulfation patterns in the plasma of septic patients at intensive care unit (ICU) admission predicted persistent cognitive impairment 14 days after ICU discharge or at hospital discharge. Our findings indicate that circulating 2-O– and N-sulfated heparan sulfate fragments contribute to septic cognitive impairment. Citation Information: J Clin Invest. 2019;129(4):1785-1800. https://doi.org/10.1172/JCI96313. Understanding the tumor immune microenvironment (TIME) promises to be key for optimal cancer therapy, especially in triple-negative breast cancer (TNBC). Integrating spatial resolution of immune cells with laser capture microdissection gene expression profiles, we defined distinct TIME stratification in TNBC, with implications for current therapies including immune checkpoint blockade. TNBCs with an immunoreactive microenvironment exhibited tumoral infiltration of granzyme B+CD8+ T cells (GzmB+CD8+ T cells), a type 1 IFN signature, and elevated expression of multiple immune inhibitory molecules including indoleamine 2,3-dioxygenase (IDO) and programmed cell death ligand 1 (PD-L1), and resulted in good outcomes. An “immune-cold” microenvironment with an absence of tumoral CD8+ T cells was defined by elevated expression of the immunosuppressive marker B7-H4, signatures of fibrotic stroma, and poor outcomes. A distinct poor-outcome immunomodulatory microenvironment, hitherto poorly characterized, exhibited stromal restriction of CD8+ T cells, stromal expression of PD-L1, and enrichment for signatures of cholesterol biosynthesis. Metasignatures defining these TIME subtypes allowed us to stratify TNBCs, predict outcomes, and identify potential therapeutic targets for TNBC. Citation Information: J Clin Invest. 2019;129(4):1801-1801. https://doi.org/10.1172/JCI128527. Citation Information: J Clin Invest. 2019;129(4):1802-1802. https://doi.org/10.1172/JCI126975. Citation Information: J Clin Invest. 2019;129(4):1803-1803. https://doi.org/10.1172/JCI128262. Citation Information: J Clin Invest. 2019;129(4):1802-1802. https://doi.org/10.1172/JCI126976. Citation Information: J Clin Invest. 2019;129(4):1803-1803. https://doi.org/10.1172/JCI128261. Citation Information: J Clin Invest. 2019;129(4):1804-1804. https://doi.org/10.1172/JCI128836.